Cloud B Twilight Turtle Discounts Apply ! The Cloud B Twilight Turtle makes bedtime and dark places a lot more safe and secure! 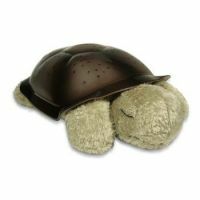 This plush turtle with a sturdy plastic shell can be placed in the center of the room to project a starry night sky on the ceiling and walls. Parents and kids alike will enjoy identifying eight major (a helpful Star Guide is included). While the starry projection is best from the center of the room, every turtle we know usually spends his nighttimes curled up under the blanket with their favorite bedtime buddies! Lights automatically shut off after 45 minutes to preserve battery life. Three soothing starlight color choices. Runs on three AAA batteries (first set included). Includes a warm-hearted story about how Twilight Turtle, separated from his father, uses the constellations to find his way home. Includes a certification of adoption.